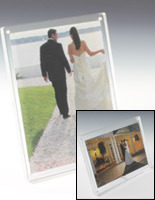 Each Acrylic Block Picture Frame's Stylish Design Fits with Any Background. The Photo Displays comes with (2) 6mm Thick Blocks to Hold Pictures. 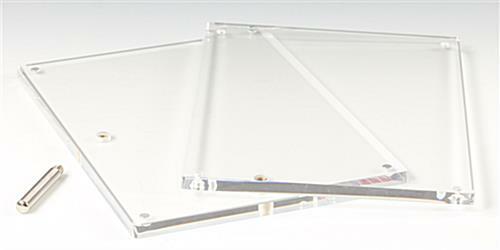 This Acrylic Block Picture Frame if Purchased Before 1PM EST Monday – Friday Qualifies for Same Day Shipping. 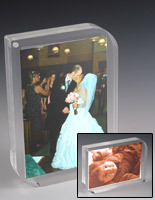 5" x 7" 8.5" x 11"
The acrylic block picture frame can be used in retail stores. Each display can hold photos or achievements up to that size. 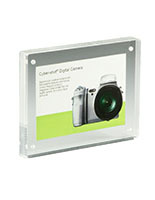 This acrylic block picture frame's small footprint makes it easy to place this holder on any office or home desk. The photo display doesn't have matted edging to take away from the viewable area. 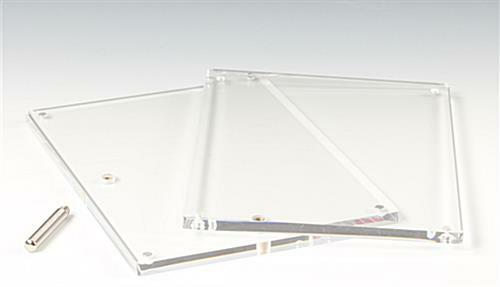 This acrylic block picture frame is frameless! These photo holders make changing out photos easy, since there are no retainer clips on the backing! 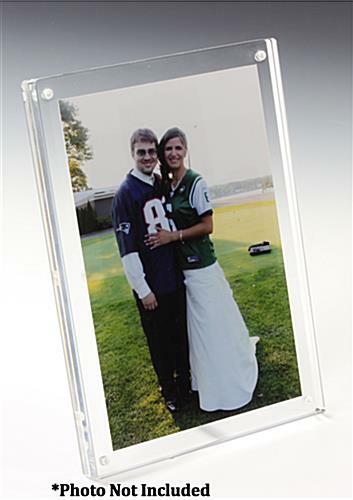 The acrylic block picture frame that is frameless is completely see-through. Each photo holder's contemporary look makes this display easy to present in any area! 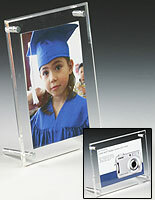 The acrylic block picture frame fits in seamlessly with glass countertops! The displays thick panels make this photo easel more durable than typical plastic sign frames. 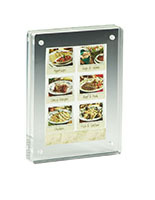 Each acrylic block picture frame that is easy to use has (4) magnetic corners. 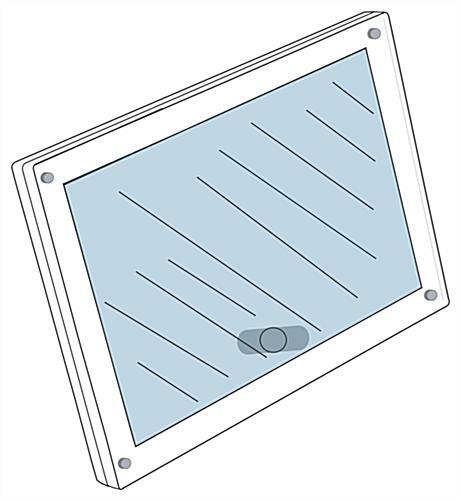 The display's magnetic corners make it simply to remove or change pictures frequently. 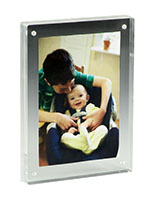 The acrylic block picture frame comes with one silver finish rod, which acts as an easel backer. The photo holder can be used to hold up signs in a jewelry department. 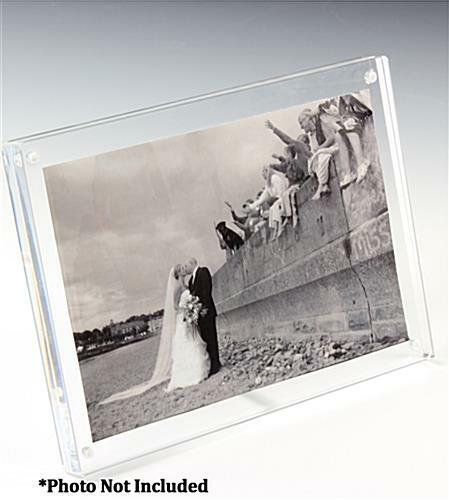 This acrylic block picture frame can be used in home settings too. The frameless display ensures more focus will be put on the photos! 4.9" x 6.8" x 0.5"